UIDAI, the main authority for issuing Aadhar cards in India, launched the mAadhaar app. By mAadhar app, UIDAI has made it easy for end users to carry unique identification profile in your mobile with this simple mAadhar application for Android, iPhone iOS, Windows phones. Below we have provided direct links of play store to download mAadhar app online for free. mAadhar app is currently only available for Android mobiles only, the Windows phone version and iPhone iOS version will be made promptly. The mAadhar app can be downloaded from play store directly from the link given below. Alternatively, you can use mirrors for mAadhar app download. The main features of the mAadhar app are as below. It also lets users lock/ unlock their biometric data that are linked to Aadhaar via the app to secure their personal data. It allows viewing and sharing updated Aadhaar profile via QR (Quick Response) code — the two-dimensional barcode, and sharing eKYC (electronic Know Your Customer) details with service providers such as telecommunications companies. UIDAI has said that the app is currently in beta mode that means the bugs and issues occurrence can occur. Some of the services will only be applicable after subsequent updates, it added. mAdhar also has a “Time-based One-Time Password (TOTP)” feature that can be used instead of SMS (short messaging service)-based OTP (one-time password). If you are willing to get the mAadhar app in your phone, then go through the links given below. mAadhar app download can be downloaded from play store from mobile. On the above last two links, only informational article exist for the mAadhar app for Apple and Windows phones, we tried to collect some links from the internet for viewing aadhar card in the iPhone and Windows phones. Those apps are of course not the official ones. The latest buzz in the smartphone users is to grab the latest mAadhaar APK. If you are not able to get the mAadhaar app from the Google Play Store then the only option left with you is to get mAadhaar apk from mirror sites like apkpure, uptodown or aptoide etc. 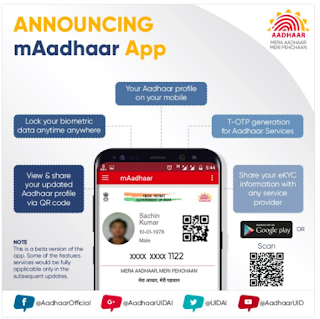 mAadhaar apk download is possible from our resources site too, they also provide the latest version of updated mAadhaar apk app to let you do all the tasks that are supposed to be done by the Aadhar card in mobile. UIDAI Aadhaar app is also trending in the Google search suggestion pages. If you search in the Play Store for “mAadhaar”, then you will see the first application listed there from some publisher named Bharat Tech.. that mAadhaar apk is not the official one and that doesn’t work even. That app is just a webview of the Aadhar website. Hence, you should take care in downloading the original mAadhaar app from the links we gave above only. We have compiled few guides and resources to help our users who are complaining about the bugs and issues in the mAadhar app today. The first task which you need to do to use the mAadhaar APP is created password, but the password conditions are very strict and you might fail multiple times if you don’t follow the guideline for mAadhaar app, so please check the guide at Tips on How to Create Password in mAadhaar App – WORKING Examples Added page. The launch of the mAadhar app is one more jewel in the bags of Modi Govt’s Digital India Mission. Modi Govt. has been doing good things to make life easy with the use of technology and the mAadhar app is not an exception of it. If you face any issues and problems while downloading the mAadhar app in your android mobile, then we recommend you to leave a comment below. We will try to solve your issues and provide you an assistant to help madhar app download. Subscribe below for more updates on UIDAI mAadhaar App, mAadhar Apk Download Android Mobile.